In the last few months, I’ve experienced a brand new feeling that can only be described as “nesting.” I think it’s a combination of factors: winter has led to more than a few HGTV marathons, a few of my friends have recently bought houses, and I’m increasingly sick of the ill-fitting slipcover on my sister’s-boyfriend’s-old-couch-that-he-gave-me-for-free greeting me everyday when I get home from work. Whatever it is, I’ve recently found myself looking longingly at Zillow listings and flipping through the home decor pages on Pinterest more than usual. This is a new and strange feeling, considering, until recently, I really thought you could only buy a house once you were married and settled and knew what school district you’d want little Bobby and Joanie to be in. Maybe I will, Jane. What are you gonna do about it? But it turns out, you can buy a house whenever you have enough money and a desire to do so. And single ladies have been doing it for themselves for centuries. Take the Homestead Act, signed into law by President Abraham Lincoln, in 1862. The Homestead Act encouraged development out West by offering 160 acres (later 320 acres) of land to anyone who was willing to “prove up” and stay on the land for five years time. In addition to encouraging westward expansion and bringing agriculture to vast expanses of undeveloped land, the Homestead Act was also intended to bring a bit of family values to the Wild, Wild West. So wild, Will Smith. So wild. And they didn’t really care who brought those family values. The Homestead Act was open to immigrants, African-Americans and even women — anyone who was willing to work the land and chase those pesky saloons out of town. In some states, as many as one in five Homestead deeds were given to women. They had to be 21 years old and the head of their household, which allowed single, divorced or widowed women to claim land. Some of these women helped their families by homesteading adjoining properties, thus expanding the family land in their name. But others were just single ladies that wanted a shot at the American Dream. Elinore Prewitt Stewart was working as a laundress in Denver when she decided to try to “prove up” on 160 acres of land in rural Wyoming. She moved to Wyoming to serve as a housekeeper for a rancher, Clyde Stewart, with the agreement that she would homestead land that adjoined his. Stewart wrote extensively about her experiences as a female Homesteader, including in letters to her former employer back in Denver. I…I can see the beauty of the sunset. Stewart published her letters in the Atlantic Monthly, as well as in two books, “Letters of a Woman Homesteader” and “Letters on an Elk Hunt.” She gained national fame, despite a little hiccup when she had to give up her land just before she proved up — she married Clyde Stewart and they maintained a single residence, forcing her to give her land to her mother-in-law to avoid violating the law. Gwennllian Evans was Montana’s first female Homesteader. The widow from Wales moved to the United States in the 1860s, looking for an opportunity. And she found it, in a town today called Opportunity, Montana. Right between Butte, Wise River and Pappa’s Place. They call it like they see it out West. Evans’ greatest claim to fame is her son, who was a well-known rancher and land agent for industrialist Marcus Daley. But she did alright for herself, too. Evans opened the area’s first post office, serving as postmistress for the area. She lived on her homestead until her death in 1892. Laura Etta Smalley was one of the many Canadian women who crossed the border to circumvent Canada’s laws against women owning land. Smalley was a schoolteacher who was among the first to acquire land under the Enlarged Homestead Act of 1909. She homesteaded 320 acres in Montana, maintaining her own land and residence, even after she married another homesteader. That worked out nicely, since her husband lost his land in 1926. The whole family was able to move back to her land, where she lived until her death in 1973. 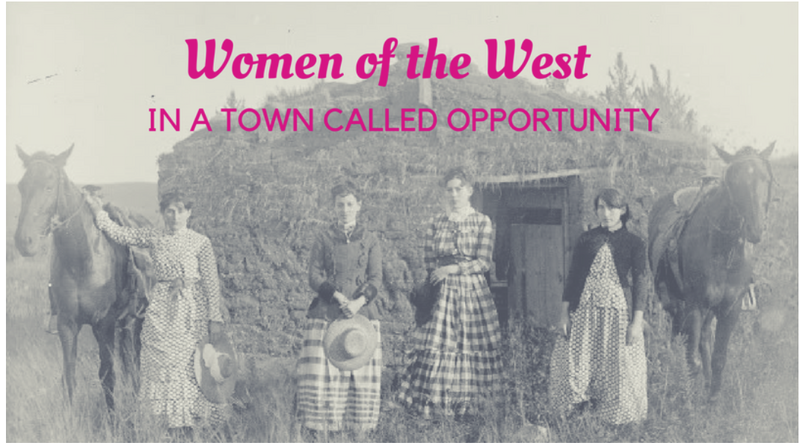 These homesteading women were part of a program intended to class up the boomtowns and brothels that characterized the western United States. And though few likely realized it at the time, they were starting a movement of women’s rights that would forever change this country. The first woman to be elected to the US House of Representatives (Montana’s Jeannette Rankin), the first woman governors of states (Nellie Tayloe Ross of Wyoming and Miriam Ferguson of Texas), and the first woman mayor of a major city (Seattle’s Bertha Knight Landes) all hailed from the West. Of the thirty-four women who have served in the US Senate, twenty-two have represented states west of the Mississippi. There are a lot of opportunities out there for the taking. Whether that’s claiming your piece of land, buying a house, asking for a raise or getting your own HGTV show, history is written by those who answer when opportunity (MT) knocks.